Brazil’s Federal Constitution ensures the right “to come and go” to all Brazilian Citizens. This was also a section of the Biennial’s main exhibition. Despite being Brazil’s seventh largest city and the heart of a major manufacturing region, Curitiba has the feel of a small yet industrious town. It may have the exotic appeal of, say, Minneapolis, but its 1.8 million inhabitants claim to live in one of the safest, wealthiest, greenest and most diverse cities in Latin America. Curitibanos also know how design ideas can make a difference: the planning and implementation of their pioneering public transportation and waste management systems, but also of their parks, cultural venues, even of Brazil’s first pedestrian street, have been the subject of worldwide acclaim since the 1960s. It’s no wonder then that as Curitiba hosted the Brazilian Design Biennial this year, one of its main exhibitions would honour the man behind many of those ideas: Jaime Lerner, celebrated architect, three times mayor and twice governor of Paraná, the city’s state. Urban Design: A Trajectory could have been the event’s landmark exhibition. Instead, Lerner was allowed to curate a self-aggrandising homage to himself, which included many of his projects for Curitiba and other cities, but also a laughable set of steel-mesh street furniture and an amusing prototype for a car-sharing vehicle – all accompanied by convoluted, lyrical rationales. Instead of providing an in-depth perspective on Lerner’s work and legacy, the biennial settled for an acritical tribute to the town’s prodigal son. This exhibition was nevertheless the exception to a quite balanced, sophisticated event. Headed by the biennial’s curator-general, Adélia Borges, a group of researchers and experts put together its de facto landmark exhibition, Design, Innovation and Sustainability. More than 200 products and services from all over the country, shown in clear, cleverly named categories, ranged from a portable crib for emergency situations to a family-owned farm certification logo, from a chronic disease management platform to a two-bike taxi. Didactic, but not preachy, extended captions often underlined the project’s shortcomings, inviting visitors to question each design in its complexity of materials, manufacturing and use. Borges’ other show, Reinventing matter, presented a close-knit selection of natural and man-made, recycled materials alongside some surprisingly refined applications. Designers and academics curated other exhibitions. “Sustainability: what do I care” was the provocative motto for posters commissioned from ten graphic design professionals and students: sadly, they were kept away from Curitiba’s pedestrian mall by Brazil’s loud presidential election campaign. 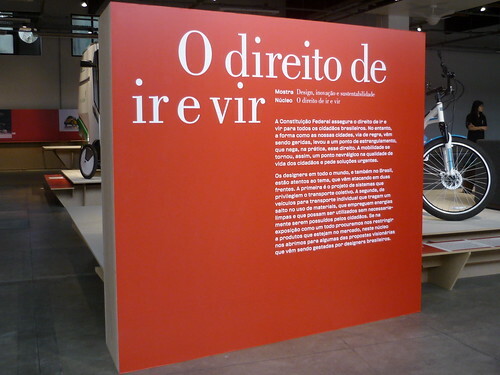 The exhibition Memory of the Industry: The CIMO Case said much about the German brothers who founded South America’s equivalent to furniture manufacturer Gebruder Thonet, but failed to mention when, or why, the Curitiba-based company ceased to exist. The student work show The Newest of the New, which included not one but two glue guns and a set of customised Monobloc chairs, displayed a few good ideas, but also uneven selection criteria. Beginnings of an Idea revisited the biennial’s past editions through documents and products shown in 1968, 1970 and 1972 (Rio de Janeiro), 1990 and 1992 (Curitiba) and the more recent 2006 (São Paulo) and 2008 (Brasília) versions of what is now a federal government initiative. It was however shy in telling how the event affected Brazilian design over these years. Much like its host city, this biennial presented Brazilian design as a series of small, yet industrious gestures concerned not with cultivating an exotic difference within a global design world, but with fostering sustainable development and social progress. It also showed the fascinating scope and potential for design in Brazil, a nation undergoing a period of unprecedented economic growth, increasing social mobility and widespread optimism. A little self-criticism wouldn’t have hurt, though. This review, commissioned and edited by Will Wiles, was published on the December 2010 issue of icon magazine. I traveled to Curitiba at the invitation of the Biennial’s organisers.